I found these cookies in a recent Better Homes and Gardens publication: Christmas Cookies. Let me say at the get-go that these cookies are addictively delicious! They are pseudo-homemade, but don't let that fool you. I thought a sweet bite of lemon sunshine would be perfect in the middle of winter baking. I was right(though it's not really winter yet)! I love that these cookies are easy to throw together and reward you with smooth, light, lemony goodness. Seriously. The cookie part of these little goodies transpires into a soft chew so that when bitten into, the filling doesn't squish out all over, but stays inside the "sandwich" and you get the full effect of the cookie and creamy filling together:) And let me tell you, it truly is a treat for the taste buds! My photos don't do them justice. There were three taste testers on hand and the consensus was a unanimous two thumbs up! *A taste test was done on 3 lemon curds and they proclaimed Dickinson's Lemon Curd the favorite: "This curd was the clear winner with its superior flavor, color, and consistency." This is the one I used, but you could make your own if you're so inclined. 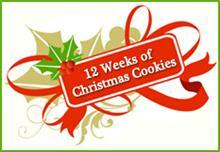 Have fun with the Christmas cookie bloghop! This is also linked up to Tidy Mom's "I'm Lovin' it Fridays." Yum! These look like they would melt in your mouth! They look tender and YUMMY! And, for the record, your photos are beautiful! These cookies look so X'mas and beautiful! They look fantastic, I love the shots! I'm a big fan of lemon desserts, these look delicious! I love the way they look with their "snow". Lemon anything is just beautiful and you cookies look perfect! The "snow" is gorgeous! Love anything lemon. These look divine. Adding them to my Christmas cookie list. LOVE the idea of a nice lemon cookie mixed in with all the usual Christmas goodies. Oooh, love all things lemon, and I love the addition of lemon curd in the filling. Another recipe to go in my file!! They look and sound delicious! I love lemon curd so I bet they will be one of my favorites! Have a great day! My tongue is tingling just thinking of these. These look so good and addictive! Beautiful, Sue! OMHeaven!!! I just love the looks of these cookies...you had me at the gorgeous pictures (I think you did a great job at portraying how good these cookies are thru your pic's) and then double had me when I read the ingredients! YUM! I love lemon cookies. They would be so pretty on any cookie tray; summer or winter. I make a similar cookie with crushed lemon drops, but not a filling. Great idea! Those sound like such deliciously easy cookies. They are pretty nice looking, too! mmm, those sound good. And I want to make a Frankenstein rice crispy treat before it's too late, Jake has a Frankenstein mask that he wears everyday so I think he would really like it. I made these yesterday & they were delicious! Thanks for sharing! I love lemon flavored cookies. And I have the same jar of lemon curd in my pantry that I need to use. Now I have the perfect use for it.